Light exfoliation with a feathered razor quickly and easily removes unwanted peach fuzz, while refreshing the appearance of the face by removing dead skin cells, smoothing skin tone and texture, and allowing for better product absorption. Many of our Denver skin care clients use dermaplaning in conjunction with our other facial care services to ensure their skin stays bright and hydrated. Dermaplaning is an exfoliating procedure that uses a feather blade to remove both dead skin and vellus hair (“peach fuzz”) on the face. This has many benefits, including better product absorption, smoother skin texture, and flawless makeup application. We often combine dermaplaning with our facials since the Denver climate can leave our skin dull and dehydrated. Will dermaplaning make my hair grow back darker and coarser? No, it is physiologically impossible for the hair to grow darker and thicker. Hair grows from the base of the follicle, which is not disturbed by the dermaplaning treatment. Most of our Denver clients usually see the hair growing back in about three to four weeks. If you would like dermaplaning to be part of your regular beauty regimen, we recommend coming in every four weeks to maintain the soft, smooth appearance. Nearly everyone is a good candidate for dermaplaning! Dermaplaning is perfect for our clients who have rosacea or those prone to redness, as it is less stimulating compared to other exfoliation treatments like microdermabrasion. It is however not recommended for patients who have cystic acne or active cold sore outbreaks. How long does the dermaplaning treatment take? A stand-alone treatment consists of dermaplaning followed by a ten minute hydrating mask this whole process takes 45 minutes. Plan on just an additional 15 minutes if adding it to one of our Yon-ka Style facials. Are there any side effects to dermaplaning? Some people might experience dryness if they do not appropriately hydrate afterwards. Is dermaplaning good for acne? No, and if you have acne you should not get a dermaplaning treatment. When your hair grows back it can feel like stubble. Will I break out after my dermaplaning treatment? 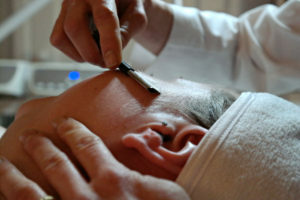 Although uncommon precautions are taken to reduce this chance by using an anti-bacterial crème following dermaplaning. Microdermabrasion vs. dermaplaning, which is better? While one is not necessarily better than the other, both have their benefits. Microdermabrasion can provide a deeper exfoliation than dermaplaning, but does not remove vellus hair. If your main concern is to remove peach fuzz, dermaplaning is the best treatment for you. Your esthetician will be able to recommend which procedure is the best fit for your needs. What should I expect after dermaplaning treatment? Most of our Denver skin care clients leave with a healthy glow to their skin. Some may experience slight redness and irritation but this is temporary and usually subsides in about an hour. As with any exfoliating treatment, good sunscreen habits are a must. Absolutely. It is super safe. We use a feathered razor that is much safer than a straight edge.